For the fastest and most efficient order processing, please place orders on our website www.monsterdisplays.com. Submit art at time of order placement to ensure faster order processing. All web orders received after 12:00pm EST will be processed on the next business day. Factory is not responsible for any server malfunction that affects receipt of order. 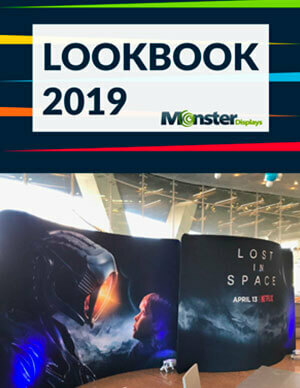 Orders may be emailed to Sales@MonsterDisplays.com DO NOT attach artwork files to emailed purchase orders and vice versa. Factory is not responsible for any server malfunction that affects receipt. Factory is also NOT responsible for omitted information on the order. All documents received after 12:00pm EST will be counted as received on the next business day. Faxed orders are accepted as original orders. Any written confirmation of a faxed order must be marked "CONFIRMATION OF FAX - DO NOT DUPLICATE" to avoid duplication of order. Factory is not responsible for any fax malfunction that affects receipt and/or omitted information on the order. All documents received after 12:00pm EST will be counted as received on the next business day. Fast Ship item numbers must be used when placing orders for this program. Complete purchase order, payment, and production-ready artwork must be received by 5:00pm EST. Proofs not available! Accuracy of the artwork is the customer's responsibility. Orders must be placed online via website. Order drop-ships from factory next business day (24 Hour Fast Ship) or in 48 Hours (48 Hour Fast Ship) via UPS or FedEx only. Fast Ship program items cannot be combined with regular lead time items on a purchase order. Maximum quantity per customer, per day indicated by end column quantity. For products not included in our Fast Ship Program, Rush Service is available and requires a prior approval by Customer Care. All documents received after 12:00pm EST will be counted as received on the next business day. Same day service is not available. 75%-100% Rush Fee – less than 24 hours production time. 50% Rush Fee – 24 hours production time. 25% Rush Fee – 2 business days production time. Standard Lead Times are listed for each product on their respective pages and are subject to capacity and inventory levels. Your order will be scheduled within our standard lead times or with Rush Service as requested to meet your required 'in hands' date. The factory reserves the right to adjust lead times. Customers will be contacted regarding affected orders. Production begins upon receipt of: Complete Purchase Order, Payment/Credit Approval, Production-Ready Artwork, and Proof Approval. All documents and approvals received after 12:00pm EST will be counted as received on the next business day. Your order will ship on, or before the scheduled ship date via the freight method requested on the P.O. Most hardware only orders placed before 2:00pm EST will ship the next day and are subject to the capacity and inventory levels. Customer Care will inform you of any order shipment delays at the time of ordering. Due to unavoidable style modifications and enhancements, products of comparable cost and style for those illustrated on Monster Displays website may be substituted. We reserve the right to withdraw any product offering without prior notification. Cancellations are subject to a 15% cancellation fee once an order has begun processing. Contact Customer Care for additional Claims/Returns processing information. All orders must be prepaid until credit terms are established. We accept Discover, Visa, Master Card, and American Express credit cards. All New Customers are required to prepay their first order. We value your Referral Partnership! Monster Displays Sales Representatives must approve all Referral programs in writing before orders are accepted. Contact Customer Care for details. Please reference your Referral quoted item numbers when placing your orders. View website www.MonsterDisplays.com, for shipping information and packaging dimensions per product. Special shipping and pricing guidelines apply to over sized products to ensure product is delivered intact and on time. All display systems are designed to provide the user with a quality and durable product. Unless otherwise stated on individual catalog or products page, standard hardware warranty is a 'one year parts and labor' warranty which warrants product against defects in material and workmanship. All graphics have a 30 day warranty on delamination or defects. Warranties do not cover damage due to accidents, abuse, or normal wear and tear. The customer is responsible for shipping the product to us for inspection. Monster Displays products found to be defective will be replaced or repaired at factory's discretion. If the issue is deemed a manufacturing defect, Monster displays will cover standard outbound shipping costs if claim is placed within the warranty period. Any damages or discrepancies must be reported within 48 hours of receipt of merchandise. Factory reserves the right to not honor any claims not reported within 48 hours. Please note, all returns are subject to prior approval by a Customer Care Representative. Returns will not be accepted after 90 days and cannot be returned without prior authorization from factory. Returns may be subject to a 15% restocking fee. Contact Customer Care for additional Claims/Returns processing information. Please contact Customer Service for details on any of our terms and conditions.